With her all-new album of original material How Mercy Looks From Here (released in 2013) being her first album in 10 years (with the previous studio album of all new material being Simple Things); CCM pop/adult contemporary legend Amy Grant has since released Be Still And Know…Hymns And Faith in 2015 (a follow up to 2 prior hymns albums- Legacy: Hymns & Faith and Rock Of Ages: Hymns And Faith. Fast forward until now, and Amy has now unveiled her brand new Christmas album Tennessee Christmas, comprising of 13 inspiring well known and obscure carols and original Christmas tunes, with Amy ardently praising God about the fact of Him coming the Earth as a baby in a manger to save mankind. Releasing her first Christmas album in just under 20 years, Amy has collaborated with Marshall Altman, Ed Cash, and Mac McAnallly as producers, in her home studio in Nashville, to create a spectacular musical experience full of worship to God and full of magical moments about being close to family during the holidays. Some may say that yet another Christmas project this year (we’ve already had releases from Matthew West, Matt Redman, Newsong and Lauren Daigle to name a few…), may seem a bit unnecessary. Yet in my personal opinion, Amy has wowed us time and time again with her stellar and relatable song writing, while also staying relevant to the current CCM sound as well (with smash hits across the years such as “El Shaddai”, “That’s What Love Is For”, “Every Heartbeat”, “Lead Me On”, “I Will Remember You”, “Baby Baby”, and “Takes A Little Time”; and thus within this inspiring and poignant tracklist of 13 encouraging melodies, Amy has once again delivered in every facet, as we are reminded of the true meaning of Christmas. As we remember why we celebrate Christmas, as well as how we can reflect and ponder on Jesus giving us new life, Tennessee Christmas is an album that deserves multiples listens, as we celebrate Jesus coming to Earth, and an album whereby we can discover more and more of our Heavenly Saviour and Creator. A glance through the thirteen track, hour long album, and one can sense that this album was created for us to discover more hidden Christmas gems rather than to be familiar with songs we’ve heard before. Out of the entire album, there’s only three songs I am acquainted with, and that are well known. “O Come All Ye Faithful”, “Joy To The World” and “White Christmas” are all covered brilliantly here, with Amy eloquently relaying the eternal truths of Jesus that existed even before He was born in Bethlehem. “Joy To the World” is a 3 minute piano and acoustic guitar only melody, where Amy passionately relays that ‘…He rules the world with truth and grace, and makes the nations prove the glories of His righteousness, and wonders of His love…’, where we can declare as well that Jesus’ birth brings the world joy; while album ender “O Come All Ye Faithful” is sung alongside a haunting and mysterious gospel like choir, with the praise and worship song being dedicated to her father, of which this particular carol is his favourite (there is an interlude of Amy explaining her heart behind the song at the beginning of the track also!). The final well known cover recorded here, “White Christmas”, features Amy singing on a 2-minute jazz/70’s influenced piano only melody where we can join in in wishing everyone a very happy ‘white’ Christmas (if you all live in the U.S. that is! ); and from these three tracks alone, I can already tell that this album will be something very special, even through the remainder of the ten songs are somewhat unknown and obscure. Even though these particular songs about the holiday season, are somewhat foreign to me, Amy’s heart for Jesus, and earnest lyrics found within, is enough to ensure that I am hooked and captivated throughout the remained of Tennessee Christmas. The title track, led by light acoustic guitar and rerecorded from Amy’s 1983 Christmas album A Christmas Album, contains quite a lot of visual imagery of the ideal and the perfect Christmas, according to Amy, which is situated in Tennessee. As we are reminded that we each all have our preferred Christmas rituals and traditions, Amy subtly infers that this season is a time to reflect and reaffirm our relationships with others no matter where we are as people and geographically. While the reflective and contemplative piano led “To Be Together” highlights Amy’s desire for her and her family to be together at Christmas time, and once again stresses the importance of family relationships during the busy season, and also the fact that no matter how chaotic the holidays become, spending time together is worth the effort and the end result of potential mishaps. While the guitar and piano led jazz inspired “Christmas For You And Me” dives deeper into Amy’s ideal Christmas (similar in content to Francesca Battistelli’s “Christmas Is”), and is a personal highlight, with Amy fervently outlining how special Christmas is to her, encouraging us all to think about how much Christmas means to each one of us as well; the more sombre “Melancholy Christmas”, led by light acoustics and keys, delves into the mindset of someone where Christmas doesn’t hold the best of memories, where the holiday season brings back hurtful and sad memories. With these two songs being juxtaposed together in the track list, we are immediately filled with a sense of happiness and also sympathy, for those less fortunate than ourselves. As Christmas is supposed to be a safe and joyful time for everyone, why don’t we spread the cheer this season? You never know, we may make all the difference in one person’s life. “December”, a piano led and electric guitar led reflective ballad/lullaby, is next, as Amy once again wows us with her complex and intricately layered lyrics, telling the story of a person who has lost their friend/relative, and is closest to them during the month of December. “I’ve Got My Love To Keep Me Warm” and “Baby It’s Cold Outside” are also featured, and represent the tracks highlighting romantic love during Christmas, as Amy sings out amongst stirring acoustic guitar that it doesn’t matter what happens during Christmas, as long as she is with her husband and family (“I’ve Got My Love To Keep Me Warm”); as well as singing a back and forth dialogue with Vince Gill, about whether to stay indoors during Christmas, or go out during a severe snowstorm (“Baby It’s Cold Outside”). While these tracks are not my favourite, nor have anything in particular to do with Christmas, the importance of family during the holiday season, and the significance of Jesus; the inclusions of these songs are a nice change of pace, and remind us all that celebrating Christmas alone is something that none of us should ever undertake. What is also remarkable and compelling are the last few tracks, where Amy also brings to the table commentary as to which aspect of Christmas inspires and impacts her the most. With “Christmas Don’t Be Late” being a reserved, laid back acoustic guitar led song about Amy wanting the season to hurry up and not be slow (similar in theme to Matthew West’s “Come On Christmas”), and “Still Can’t Sleep” being a 3-minute acoustic guitar led melody about not being able to fall asleep on Christmas Eve, reminding us all that Christmas Day should be a day that we never take for granted; the album is wrapped up with the 2 minute poignant “Another Merry Christmas”, delving into the concept of time never slowing down, thus the urgency and importance for us to cherish each day and live life to the fullest. Well done Amy for a compelling album with plenty of relevant topics to chew on and ponder over. 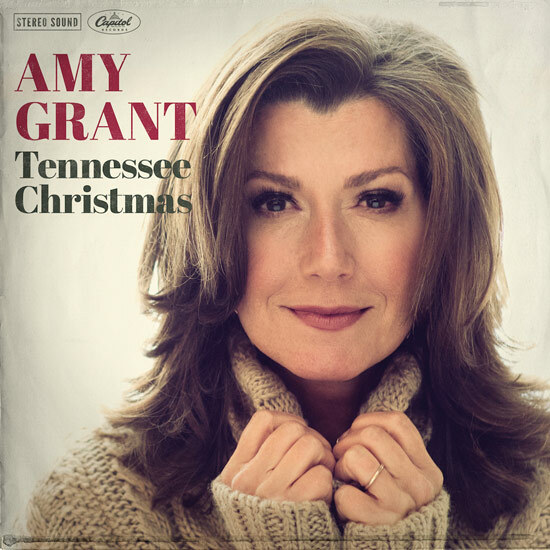 Amy Grant has given us some special carols and inspiring original Christmas tunes, as all throughout Tennessee Christmas there’s an uncanny knack for Amy to create potential classics from virtual unknown melodies. Though some tracks I would have loved to see, such as “O Holy Night”, “Hark The Herald”, “The First Noel”, “Away In A Manger”, “We Three Kings” and more; the track list is solid (considering only 3 well known Christmas tracks!) and is thoroughly enjoyable. So what’s the consensus? Amy’s choice of carols, though it may be different than other popular ones, never ceases to amaze me, as we are met with songs speaking about all facets of Christmas! Personally, I believe that Amy Grant’s new album is one full of songs that matter, and songs with stories that are very close to her heart. Amy has indeed had new life injected into her singing and song-writing, and has compiled a Christmas album that will surely be a classic in many, many years. Well done Amy for creating an album that reminds us why she is one of the best female singer/songwriters currently, and why she may record for a few more years yet!